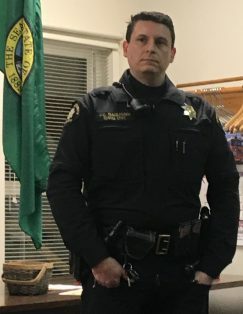 Some good news about gang activity in White Center/Burien, according to Detective Joe Gagliardi with the King County Sheriff’s Office: Most of the trouble has settled down since what he said was an eight-month gang war in the area last year. Det. Gagliardi addressed about 30 people Thursday night (March 1st) at the monthly meeting of the North Highline Unincorporated Area Council at NH Fire District headquarters. Gagliardi is the gang expert for KCSO and the head of its gang unit. Most of us have the idea of what gangs are supposed to look like from what is depicted in movies, television, and mass media, he said. However, the reality is different because most of those images are dated. “Race doesn’t mean a thing – it’s about where you’re from and your neighborhood,” he said. In fact, the leader of the “Mexican Mafia” was white, he added. Gagliardi said gang members tend to have other things in common such as poverty, or abuse and neglect when they were children. Gang affiliation is often passed down through generations. Age is not a barrier either, because the younger they start, they’ll just go to juvenile detention for a short time, and be back on the street. Although things have calmed down in White Center and Burien, that doesn’t mean gangs aren’t here. The two distinct sub-cultures in King County are L.A. and Chicago based gangs. (For their names and other details, watch Gagliardi’s presentation in the NHUAC video embedded above – he spoke right at the start of the meeting, until about 51 minutes into the video.) They all have their own distinctive colors, numbers, and sometimes symbols. To recognize gang graffiti as opposed to taggers who consider their graffiti as art, he said it’s important to recognize that gang graffiti has a purpose. It’s not very artistic – for example, gangs do not use bubble letters, rather their tags are very linear, monochromatic, and meant to claim territory or issue a challenge. Gang graffiti tells police which gangs are active in the area, which gangs are allies, which gangs are enemies and what areas they claim as their territory. “It’s an incredible intelligence source for us because it names active gang members,” he said. That’s because they usually include their street names in what is called a roll call. The other types of gang graffiti are for publicity, issuing a threat, expressing sympathy for a fallen member, political statements or simply to claim territory. What he told those at the meeting was to NOT strike out a gang message and write your own graffiti next to it, because it is considered an act of disrespect and you could set yourself up for violent retaliation. Call the police when you see new graffiti, paint over it as soon as you can to deter recurrence, but not before the police come out – or at least before you take a photo of it yourself. If you believe it’s gang graffiti, be sure to call it in rather than reporting it online, he said. Although the “artistic” taggers aren’t gang members, it’s still vandalism. They tend to go for high-visibility locations, like freeway overpasses so they can “share” their art. They’re the taggers responsible for vandalism via sticker, too. The good news, Gagliardi said, is that there has been no gang tagging recently in the area. In Q&A, the detective was asked about gunfire along Myers Way last year. Was it gang-related? He said he had no specific information about it, but said that if and when gunfire/suspected gunfire happens – anywhere – call 911. CAMP SECOND CHANCE: Josh Castle and Amy Friedman with the Low Income Housing Institute visited NHUAC with an update on Camp Second Chance, the City of Seattle-sanctioned encampment along Myers Way, just north of the city-county border. Presently, there are eight tiny houses on site, approximately 120 square feet, and LIHI has upgraded 10 tents that were in disrepair to sturdy shelter lodging tents. Castle said his vision was to eventually replace all the tents with tiny houses, which are built on skids so as to be easily moved. The tiny houses are not paid for by the city – Castle said it’s a community effort. There are now about 50 residents in the drug-and-alcohol-free community. Electricity is available in the camp, and some of the tiny houses do have electricity so they have heat. Of course, the long-term solution to the homeless crisis is for people to transition into permanent housing, and Castle said about 300 people from the various city-sanctioned camps have made the move into permanent housing. Also not tolerated in the camp is violence. Friedman, who serves as case manager at the camp, said she has never felt unsafe, as everyone in the community is very independent and enthusiastic about the community. Her job is to help residents find employment and other resources to help them get back on their feet. “I genuinely enjoy working with everyone at the camp,” Friedman said. “What you guys are doing is traumatizing my lifestyle,” LeMoine said. “My neighborhood is in a state of terror.” He referenced the “landslide” of trash, visible from highway 509, from unauthorized campers nearby. He and his partner Carol Sivertz, have called 911 numerous times reporting gunfire, open drug use, and even a two-by-four left in his driveway used to smash into a neighbor’s vehicle. He said he was probably next, but he scared the perpetrator off. Castle said the trash was not associated with the camp, with Friedman adding that the residents of Camp Second Chance are equally frustrated with the bad element nearby. It didn’t matter to LeMoine, who said he’d be happy to see the encampment go when its time is up. CRIME AND SAFETY: KCSO Captain Rick Bridges and Storefront Deputy Bill Kennamer reported that resources were being spent in downtown White Center on the block of 16th Ave. SW that is home to several bars and restaurants where there has been some trouble, including the January double murder (for which a suspect was arrested a day after the meeting, as reported here). DISABLED AMERICAN VETERANS: Another guest at the meeting talked about the DAV’s chapter located in West Seattle at 4857 Delridge Way SW, where they have monthly meetings, third Saturdays, 11 am. If you’re a veteran in need, check them out – here’s their website. The North Highline Unincorporated Area Council meets first Thursdays most months, 7 pm at North Highline Fire District HQ. Check northhighlineuac.org for updates. Thanks again for the thorough recap! Any intel on when the community will receive an update on what’s being done to manage the campers/trash on the east side of Meyers Way?